Unnecessary or inappropriate coronary stenting has been estimated to occur in up to 10-20% of elective coronary angioplasty procedures. In other words, among electively stented patients, 1 in 7 may have received an unneeded stent. The implication of this statement is that patients who are scheduled to undergo elective coronary stenting, particularly those with minimal symptoms, may be concerned about the possibility of receiving a permanent coronary implant unnecessarily. 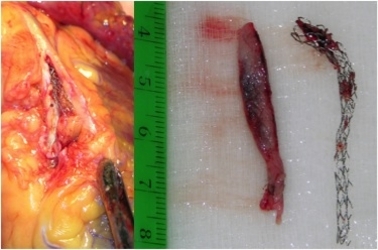 Shown on the photograph to the right is an autopsy specimen from a patient who died of stent thrombosis. Stent thrombosis occurs when a blood clot forms within the stent itself, resulting in closure of the artery. This event often leads to a heart attack (myocardial infarction) and may result in death. Patients are usually prescribed dual antiplatelet therapy (aspirin and plavix) to prevent stent thrombosis, which can happen several years after implantation. The photo to the left of the green ruler shows the surface of the heart with the artery opened up to demonstrate the location of the stent. The thrombus, or blood clot, had been removed by the pathologist and is shown at higher magnification to the right of the ruler. The stent was removed from the heart and lined up next to the blood clot to show how the stent was completely blocked up. If you look closely at the surface of the clot, you can see the diamond-shaped markings that correspond to the geometry of the stent.